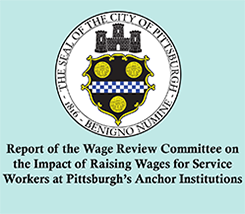 Earlier this month, the Urban Redevelopment Authority (URA), the agency that oversees economic development for our city, heard from residents, patients and workers about the need to hold UPMC accountable before investing more public money in its business. Georgeanne was joined by UPMC workers, Reverend Rodney Lyde, and others from the community. Leaders of the URA heard us. Faced with the growing calls for change, UPMC is on notice that it can’t continue business as usual. When Pittsburghers stand together and stand up to UPMC – just as we need before the URA board last week — we are making changes that strengthen our city. We are Making it Our UPMC. This summer my co-workers and I led a march of hundreds of us to take our demands for good jobs straight to UPMC’s corporate headquarters. Many of us were willing to show UPMC that we’re going to do whatever it takes to put an end to their illegal treatment of workers – and 28 of us were arrested. This Monday we are heading to court to answer to our charges. 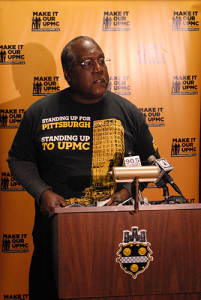 Once again, we will stand together united and continue our calls for UPMC to stop holding us back. This new economy should be providing a path out of poverty and into the middle class for thousands of us in Pittsburgh – but that won’t happen unless workers like me have a voice on the job. Can you stand with all of us who were arrested while calling on UPMC to stop holding Pittsburgh back? Rally to support UPMC workers and community members arrested standing up for good jobs. Municipal Court. 660 First Ave, Pittsburgh. We stood up to UPMC. And we won. Last week I stood together with my co-workers Ron, Al, and Leslie to tell UPMC that they could not buy our silence and that we are rejecting its settlement offer. We knew that UPMC’s treatment of us was illegal and now a federal administrative judge agrees with us. The judge even says that our hospital, UPMC Presbyterian-Shadyside, has engaged in such widespread misconduct that it demonstrates a general disregard for our rights as workers and he is ordering that we be reinstated with back pay. This is an important victory for me and for all my coworkers at UPMC hospitals across the city. Now we need UPMC to make a real commitment to stop violating workers’ rights and to let us form our union without illegal harassment or intimidation. We are calling on UPMC to stop with all of the illegal maneuvers and intimidation of workers like me who just want a better future for our families and Pittsburgh. 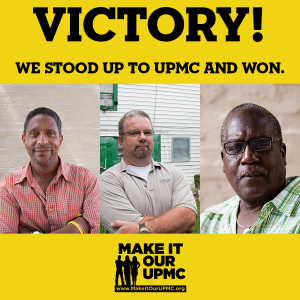 We showed that standing up to UPMC is making a difference. 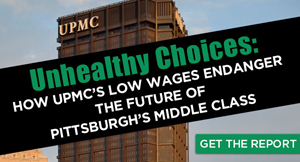 Rather than cave to UPMC’s money offer to make us go away, we knew what was right not just for us, but for the city. Can you join us this afternoon to celebrate our victory and to tell UPMC that it needs to put an end to its illegal violations of our rights?